Management function of controlling is the process whereby organization sets itself performance objectives and strives to achieve them as best it can over time. It is a method for managing the performance of the organization. It is the process oriented to verify the advancement status of the planned objectives as well as the efficacy and efficiency of the organization through the analysis of the resources, costs and proceeds. Controlling is one of the important functions of management. It pinpoints the deviations on the basis of which management can take corrective actions. Without the function of controlling, work done in the organization is not systematic and as per plans, since the inefficiencies remain undetected. For achieving the objectives and targets, it is necessary that the actual performance is assessed from time to time to ensure that what is being achieved is in conformity with the objectives and targets. This is done through the controlling function of the management. Thus, controlling as a function of management refers to the evaluation of actual performance of work against planned or standard performance and taking the corrective action, if necessary. Controlling function of the management is not to be seen as an activity of the exclusive competence of the administration area, but rather as a process which involves, at the appropriate levels of responsibilities of all the functions of the organization. As with all processes, the controlling function is constituted by different elements which are connected to each other. These elements are (i) the structure (personnel charged of the duty of control), (ii) the tools (general accounting, data analysis, statistical analysis, budgeting, reporting), and (iii) the procedures (coordination, optimization). Different management experts have defined the function of controlling in the following way. The concept of control implies the following. The concept of control does not define only actions, mechanisms, procedures, but also a ‘philosophy’ developed within the organization which allows the activity evolution in accordance with stakeholders’ plans, purposes, and expectations. Controlling is the management function of establishing performance standards, measuring actual performance activities to see if the standards have been met, and taking corrective action. The purpose of controlling is to determine whether people and the various departments of the organization are on target and are achieving the progress toward the objectives that they planned to achieve. While planning determines goals and maps out the necessary strategy and tactics, controlling attempts to prevent failure by providing the means to monitor the performances of individuals, departments, divisions, and the entire organization. Controlling is also critical because organization resources are limited. Their acquisition and use are critical to the survival of the organization. Hence the organization cannot set resources in motion toward a goal without monitoring the progress of the resources. Hence the organization operates with monitoring of the performance of employees, the expenditure of funds, or the production of goods. Controlling affects and is affected by the other four functions of the management. Controlling is an instrument for planning, accounting, analysis and control of the status of the operations within an organization. It is used for decision-making on the basis of a system for data collection and processing, which is a system of constant assessment from different points of organizational departments, organizational branches, managers and employees. The processing comprises accounting, analysis and control as an integrated function. It requires (i) increase of the level of knowledge of the specialists within the organization and activation of their intuitive and logical awareness, which promotes flexibility of the management system and attain the objectives of the organization at the same time, (ii) formation of a controlling system which is to become the basis for the timely improvement of the informational and methodical support of organizational management and to minimize the probability of an occurrence of collapses between the needs of the environment and opportunities of the organization to satisfy the same, (iii) creation of instruments in the field of prediction of the efficiency of the interaction of the controlling and the management within the organization, of the choice of the rational direction of their development and the analysis of the production processes and realization of the produce of the organization. The controlling function of the management acts through the following phases in sequence (fig 1). Planning, where for the organizational unit a set of objectives must be defined, that is of specific expected results, which need to be understandable, agreed, and measurable in extent and time, reachable, consistent with one another and with the available resources. Programming, where a programme is drawn up in order to get the planned objectives, taking into account the internal and external restraints to the organization. Result checking, where it is measured whether the organizational unit has achieved or not the assigned objectives. Shifting analysis, where the possible shifting between objectives and results is analyzed. Thus, controlling involves (i) knowing the nature, quantum and time frame of the work, (ii) comparing the performance with the plan, (iii) analyzing deviation, if any, (v) taking corrective steps, and (vi) suggesting revision of plans, if necessary. The following are the basic characteristics of controlling function. Controlling is closely linked with planning. Control is said to be checking performance as per what has been planned. So planning precedes controlling and sets the standards and targets of performance. Controlling is a continuous process. It is an ongoing and dynamic function of management. It involves a continuous review of performance and is not a one-time exercise. The period of control normally depends upon the nature of work, the amount of work and the policies of management. Controlling is all pervasive. It is embedded in each level of organizational hierarchy. Control is exercised at all the levels of management, and is done in every functional area and at each unit or department. Controlling is a tool for achieving organizational activities. It is an action-oriented process. It points out errors in the execution process. The very purpose of control is defeated if corrective action is not taken for improvement of performance or the revision of plans. Controlling is forward looking. Control is futuristic in nature. It measures current performance and provides guidelines for the corrective action. This ensures future performance as per plans. Due to these characteristics, controlling (i) helps in achieving the targets, (ii) helps in taking corrective action on time, (iii) helps in monitoring and improving employees performance, (iv) helps in achieving better coordination, (v) helps in better planning, (vi) helps in minimizing errors, (vii) facilitates decision making, and (viii) simplifies supervision. There are three types of control. They are (i) feed forward controls, (ii) concurrent controls, and (iii) feed-back controls. These are described below. Feed forward controls are future directed. They are designed to detect and anticipate deviations from standards at various points. Such preventative controls focus on establishing conditions that makes it difficult or impossible for deviations from norms to occur. Examples include safety equipment, safety procedures, job descriptions, job specifications, inductions and orientation training etc. 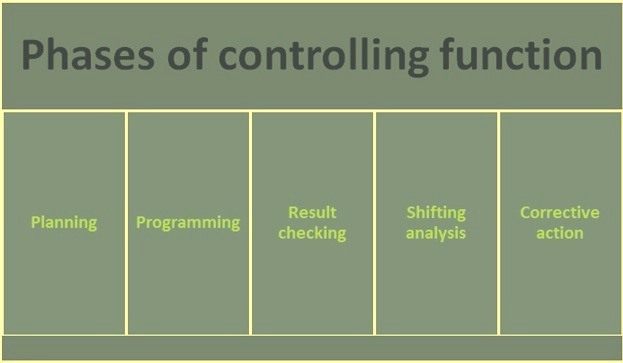 Concurrent controls are sometimes known as ‘in-process’ controls, these controls apply to processes as they happen. Audible warnings mark this type of control. Feedback controls are post-performance controls and they focus upon the end results of the process. The information obtained is used for corrective purposes. Adjustments and/or corrections follow the feedback input. Control systems are the composite feed forward, concurrent, and feed-back controls. Control system can consist of a combination of any two or more controls. Any combination of these controls is used to accommodate various management control needs. Further controls can be grouped according to three general classifications namely (i) the nature of the information flow designed into the system (open- or closed-loop control), (ii) the kind of components included in the design (man or machine control systems), (iii) the relationship of control to the decision process (organizational or operational control). The control process is generally a three step process of measuring actual performance, comparing it against a standard, and taking managerial action to correct deviations or inadequate standards. The following are the requisites of effective controls. Focus on critical points – The critical control points which need focus include all the areas in the organization which directly affect the success of its key operations. Such points focus specifically on those areas at which failures cannot be tolerated and where time and costs are crucial. Integration – Controls must not be haphazardly placed. They must function harmoniously within the established processes of the work. In short, they should not be bottleneck in the operations. Trust, confidence, and acceptance of all controls must be a part of the culture. Employees must have faith in these devices. Acceptability – As with integration, employees must accept the devices, tools or methods of control. The necessity, usage, and appropriateness of the controls must blend with the personnel involved. The acceptability of controls is important for their effectiveness and efficiency. Timeliness – Deadlines, time costs, and punctual needs are apparent in these criteria. Costs are frequently attributed to time shortcomings or failures. Economic feasibility – Economic feasibility of controls is important. The accompanying expenses to any control or system of controls need to be analyzed and the costs are to be compared with the benefits. Accuracy – The information for the control must be useful and accurate. Reliability and validity of diagnosed deviations from standards must be accurate. They are to be consistent and they measure what is intended. Comprehensibility – Complexity can cause confusion. Management must favour simplicity. Control system must be as simple as practicable. Ease of understanding and application is often associated with simplicity. Controls are required to be monitored to determine the degree of organizational impact that they have, both on people and on systems. When controls are developed, employees may resent them as unnecessary, strict, or demeaning. Employee involvement in the design and implementation of the control is critical to reduce or eliminate anxiety and resentment. Controls also need to be monitored to limit the potential impact on organizational patterns and systems because controls can have side effects. One potential answer for management is to use program evaluation techniques to monitor the system. One technique, before-and-after comparison, looks at the environment before and after the system is installed to note any differences and why they occurred. Other potential options include time trend data comparisons, comparisons between affected and unaffected parts of the organization, and controlled experimentation. In determining the impact of controls on various parts of the organization, questions need to be asked in the areas of goals, structure, decision-making, and human relations. Management need to know the impacts of controls. Controls can generate support or antagonism. Involving employees in the design of controls can help ensure support. Controls that employees believe are equitable seldom encounter resistance. When ensuring the effectiveness of controls, management can use these techniques namely (i) conducting before-and-after comparisons, (ii) surveying the employees affected by the controls, (iii) performing controlled experiments, and (iv) updating the controls when necessary or as required. Controls are effective as long as (i) they do what they are intended (prevent deviation, diagnose deviations, treat deviations, or provide information for future planning), and (ii) they do not create organizational problems that result in costs greater than the benefits of the control devices. Controls are effective only as long as they do what they are intended to do. When the control devices are designed, they are with a certain set of expectations and under specific circumstances. If these circumstances and expectations change within the organization, the control devices need to be reviewed and possibly updated or replaced. The instant changes are planned or occur in operations, managers should begin to examine how adequate the present controls will be for these changes. Controls need to be current. Controls can play five important roles in organizations. These are as follows. Control systems enable managers to cope with uncertainty by monitoring the specific activities and reacting quickly to significant changes in the environment. Controls help managers detect undesirable irregularities, such as product defects, cost overruns, or rising personnel turnover. Controls alert managers to possible opportunities by highlighting situations in which things are going better than expected. Controls enable management to handle complex situations by enhancing coordination within the large organization. Controls can decentralize authority by enabling management to encourage decision making at lower levels in the organization while still remaining in control.